Once you get accustomed to walking in these shoes, you can wear them simply while taking an evening walk in the lawn and achieve effective aeration without any extra efforts. Material:Selection of high-quality PP material a molding, high strength, good toughness,perfect for lawn turf breathable,construction industry. Universal fit goes over most any size shoe or boot. Simply adjust the straps for larger shoes. 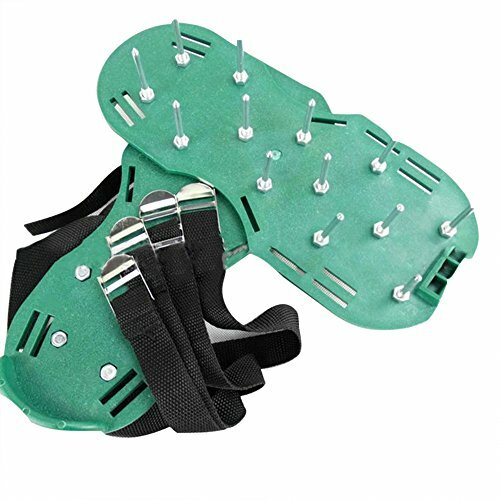 Alternative to renting expensive lawn equipment,healthier,environment,You can revitalize your yard simply by wearing these spiked shoes and walking your lawn at any time you like. Super convenience:made of a sturdy plastic base which provides a good heel support,Attach spikes to molded plastic base, strap onto your shoes, and take a walk on your lawn. 3 durable straps with strong metal buckles(instead of 2 with plastic buckles) - Now you won't worry about the buckles breaking or the sandals coming off easily. If you have any questions about this product by Pannow, contact us by completing and submitting the form below. If you are looking for a specif part number, please include it with your message.